Hello and Welcome to A Paper Pumpkin Thing Blog Hop highlighting the fabulous March PP Kit called May Good Things Grow! This is probably one of my very favorite kits! So many fabulous options with this one!! I'm not sure how you change things up with a Paper Pumpkin kit, but I always start by making a card or project as kitted first. This gives me an opportunity to decide what I love about the kit first. I have to tell you that this month was so awesome as designed but it was also very versatile and had so much product that allowed for a lot of options! 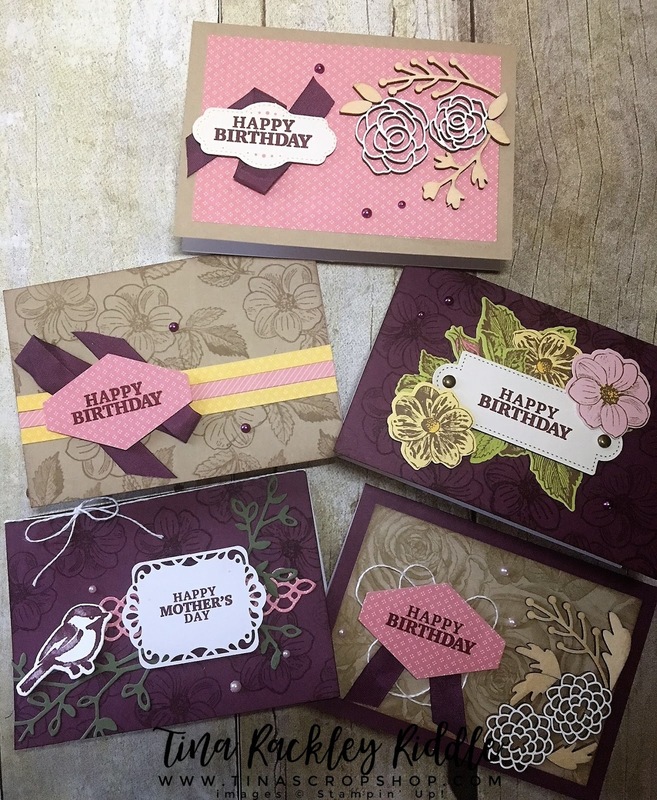 I made some cards that strictly used items from the kit, others added a punch and one added a stamp and die bundle. If I were to have a nickname it would likely be Tone-on-Tone Tina! lol I love using that technique for a fun background. 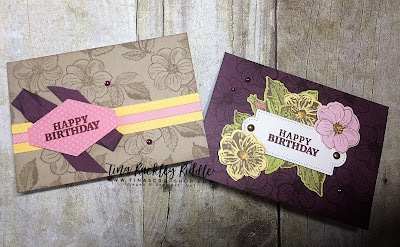 In these two pictured cards, I used stamps from the kit to stamp the background. 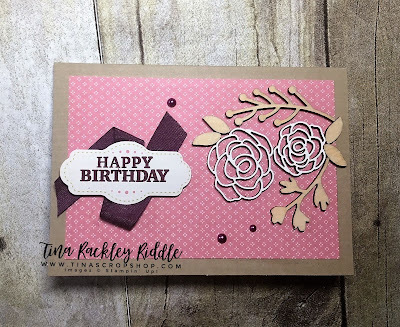 On the card on the left everything was from the kit with the exception of the Tailored Tag Punch used for the sentiment and the Fresh Fig and Crumb Cake Ink. The card on the right was exclusively Kitted Product except for the addition of the Fresh Fig Ink. 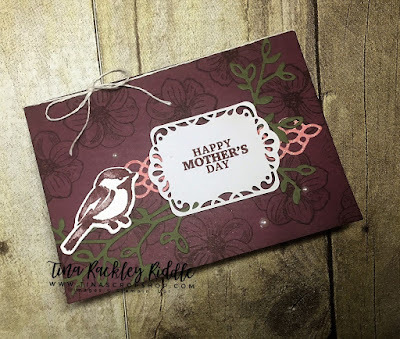 The card pictured above used products from the kit except for the addition of the Fresh Fig Ink for the sentiment. I loved the gift of the wooden elements from the kit So much fun! 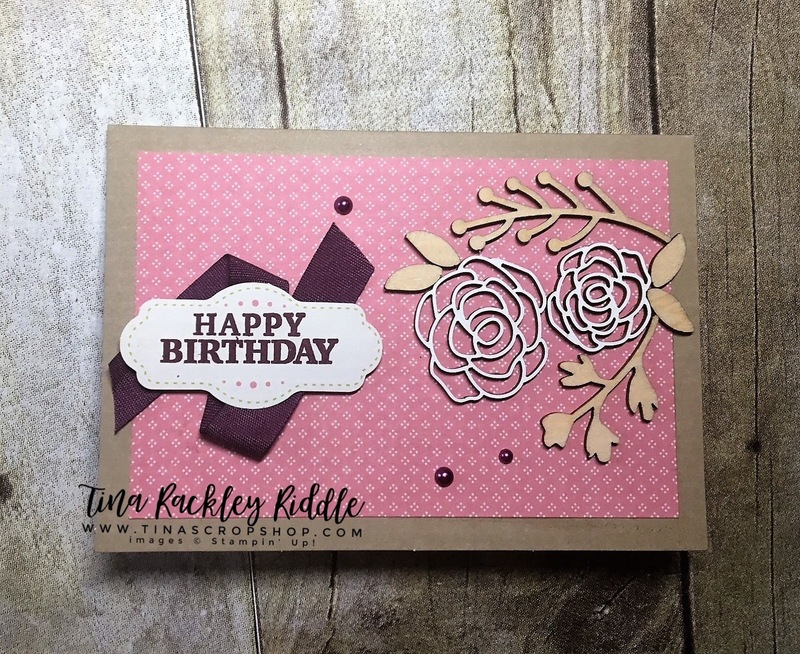 This had a little more added with the stamped bird from the Petal Palette Stamp Set and cut out with the Petals and More coordinating dies. The greenery is from the same die set as was the strip behind the label die. I also added the Fresh Fig Ink as I did more Tone-on-Tone Stamping for the background. I added some of the enclosed White Twine across the top of this one. I love twine! Well tone on tone Tina, you've created a great set of cards without a lot of "extras". What a fun set of cards. Great use of the kit.